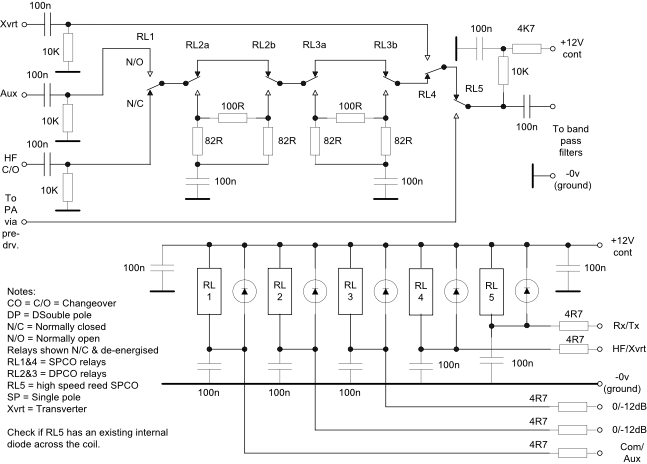 Relay switching in small signal circuits requires some careful thought because of the need to wet the contacts with a small DC current in order to overcome the contact oxide layer and initial resistance. There is also the need to consider the changeover speed if full break-in CW operation is required. 1. Two stage attenuator for the front end of a receiver. The nominal attenuation is 12dB per section with the theoretical values but 12.5dB with the nearest standard values as shown. The relays are not critical and do not need to be high speed but should have gold plated contacts. Relay contacts are shown in the normally closed (de-energised) position. Depending on the relay contacts the wetting current may need to be increased. A PCB layout may be downloaded from here. Please note that the two 12v feeds should be connected together. 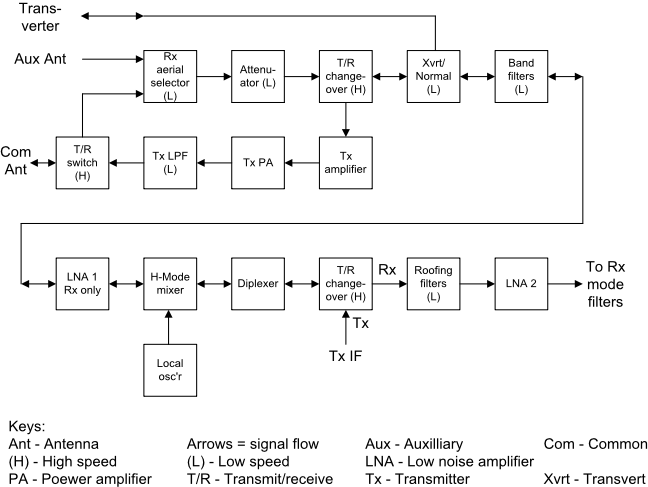 The following block diagram shows a possible front end design for a receiver / transceiver and the switching options for different functions including bands and transmit/receiver changeover. The receiver must provide the listener with the highest possible quality of reception and the various switches should not reduce the signal quality below that provided by the non-switched circuits. Ordinary diodes: Fast operation but non-linear current/voltage characteristic can make strong signal handling a problem and limited attenuation in the off state. PIN diodes: Fast operation and much more linear than ordinary diodes but the storage / reverse recovery time must be long compared to the lowest frequency of operation. Limited attenuation in the off state. High power versions available. Conventional small relays: Make and break times averages about 20mS so not fast enough for full break-in. Contacts require a DC wetting current to overcome contact problems with low signal levels. Single pole changeover allows a shorting facility in the off state. Ideal for band and filter switching. 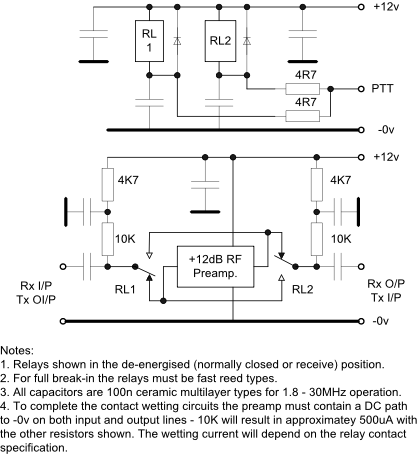 Reed relays: Make and break times typically 1mS so fast enough for full break-in but contacts are often rhodiumwhich requires a higher wetting current so check the specifications. Limited voltage and current contact ratings so not suitable for powers exceeding a watt or two. Contact spacing is very small so limited signal attenuation across the normally open contacts. Ideal for low level transmit / receive switching. Analog switches: Modern types have high linearity and low series resistance but low supply voltages make them less suitable for use in broad band front ends although ideal after the mode filters. They are usually specified for cross talk and attenuation in the off state at a given frequency. In the above block diagram several switches including one to bypass the first LNA must be fast if full break-in CW operation is planned. The second LNA feeds the main mode filters in the receiver. This slightly updated version has moved the transverter relay contacts so that the transverter signal flow does not involve the attenuator relays and moved the Tx pre-driver onto a separate PC board. The 4R7 resistors limit the discharge current from the 100n capacitors when a relay is energised and increase the minimum pull-in voltage by a very small amount. Signal carrying lines should be in the form of microstrip on a double sided PCB or in coaxial cable to minimise signal radiation and maintain a 50 ohm environment. On transmit the total loss through the receive path of RL5 and the HF T/R switch must be significantly less than the total gain in the HF preamplifier and HF PA to ensure that the transmitter PA does not oscillate. An example PC layout may be downloaded from here. Where the signal path must be shared between transmit and receive then a low distortion switching system must be employed as shown to the right. PIN diodes could be used instead of the relays although a different biasing system would be required to that shown. For full break-in CW the relays should be fast reed types although convention relays will be fine for semi-break-in. Also check if the reed relays have an inbuilt diode across the coil in which case the diodes shown will not be required. The 4R7 resistors are to control the discharge currents of the 100n decoupling capacitors when going to transmit. 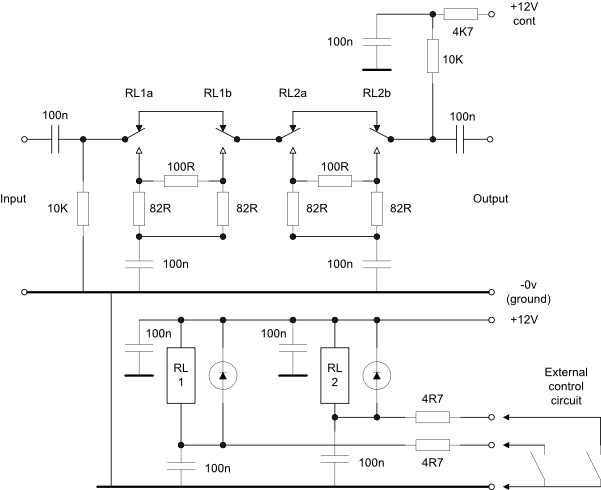 The 12V line should be well decoupled to prevent noise finding its way into the preamplifier. A double sided PC board will provide a low inductance ground plane and minimise the risk of RF instability. The preamplifier can use the broadband circuit shown in Solid State Circuits 1, item 5.